Spicy Rockin’ Shrimp Tempura For 5 Bucks?! Ask and you shall receive. No I’m not talking about a genie and the lamp – I’m talking about the Blue Wasabi Sushi & Martini Bar Facebook page. If you haven’t had a chance to visit the Blue Wasabi page yet please check it out. We have a thriving community over there. A place where our fans can come together to discuss their favorite rolls, martinis, ask questions and leave feedback. Many businesses use their Facebook brand pages to market to consumers, not us. We use ours to listen and share. We were in the process of making another video “Behind The Blue Wasabi Sushi video” when we got a request for another item from a Blue Wasabi Fan. Jennie asked for a making of the Spicy Rockin’ Shrimp Tempura. Never one to disappoint, we couldn’t resist. We asked the great Chef Robert if he wouldn’t mind sharing some of his secrets with you – our fans. The making of the Spicy Rockin’ Shrimp Tempura is below. Thanks Jennie! After you’ve tasted it, post your thoughts below, on our Facebook page or Twitter. We want to know what you thought of the Spicy Rockin’ Shrimp Tempura! Tell your friends, tell the world and as always, thank you for your support. Do you have any other rolls you would like to see made? Please leave your requests below and we’ll do our best to make it happen. *To get in on this smokin’ deal show your server our blog post, eblast, Facebook post, or tweet about the promotion! Have you heard about it? You will. It’s called the Three 6 Mafia Roll and it’s “poppin” more than collars. To say the Three 6 Mafia roll is making waves at Blue Wasabi Sushi and Martini Bar would be an understatement. 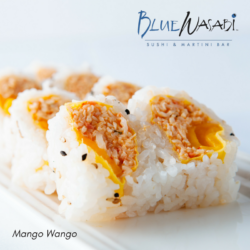 Introducing rolls at Blue Wasabi is nothing new, let’s see – there is the Kiss My Bass, the Tail of The Dragon, the Marilyn Monroll, Wango Mango Roll but this one, this one is unlike any sushi roll you have had or likely will have. This one is special. Think of this roll as the secret club only the “in crowd” knows about. That’s because the THREE 6 Mafia Roll is not on the Blue Wasabi Sushi menu. Only the “in crowd” knows about it – YOU. If you have watched our videos in the past you know that Jim is always yacking about “texture and flavor”. Well, Sushi Chef Chris [below] has decided to take the texture and flavor thing to a whole new level by adding POP Rocks. Yes – this is the Three 6 Mafia Rolls secret ingredient. Try The Three 6 Mafia Roll! Take a look at how the Three 6 Mafia Roll is made below. Come on in to Blue Wasabi Sushi & Martini Bar either in Scottsdale or Gilbert and ask for the Three 6 Mafia Roll Today!